This 608-2RS miniature radial ball bearing has red double seals and a nylon cage, and conforms to the ABEC 1 precision standard. This light duty bearing has an 8 mm bore diameter, a 22 mm outside diameter, and a 7 mm width. Its precision is rated at ABEC 1 by the Annular Bearings Engineers Committee (ABEC), allowing higher speeds and creating lower friction than less-precise ball bearings, and its radial internal clearance is C3 for radial slack between the inner and outer rings is greater than CN (normal) to compensate for thermal expansion. This bearing is made of ASTM International 52100 steel and heat treated to increase hardness for optimum wear resistance. Its deep ball grooves in both races support high radial and axial loads, its straight bore fits conventional cylindrical shafts, and its nylon cage prevents the balls from coming into contact with each other during use, reducing friction, vibration, and noise. Removable single lip contact seals on both sides protect against contaminants and retain lubrication applied at manufacture. 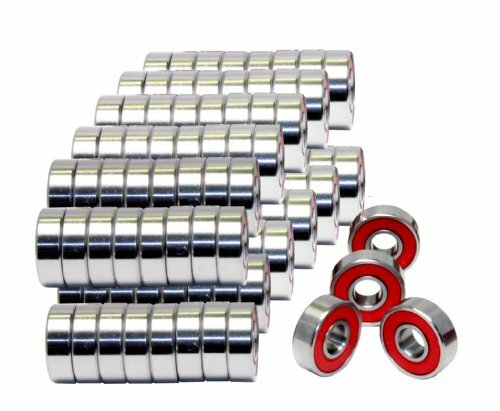 This ball bearing is suitable for use in skate boarding, inline skating, and other skating applications.